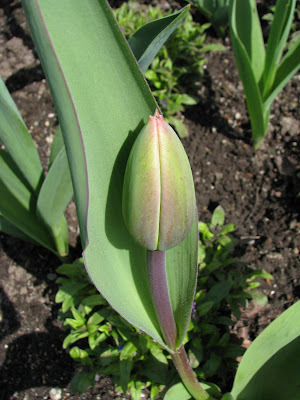 My mom used to say at the first sign of a tulip that Spring has sprung. Wishing you many springy days to come! I bet you can't wait to see it open. I love spring! I owe you a tremendous apology. I must be suffering from the same syndrome that plagued you a few weeks back. I apparently stuck a letter out for you without any postage on it. It was returned to me today embarrassingly enough. I am so sorry as in my letter was thank you for the adorable egg sleeves!! I don't remember if I emailed or blogged you a thank you also, so I just wanted you to know how cute they were and how gracious we are for you to have sent them!! Plus thank you for your beautiful bookmark again!! It is currently busy marking "Case Histories" which another friend loaned to me. Looks like spring is coming. EEEE!! It's Spring, It's Spring, IT IS SPRING!! Thanks for stopping by Chaos today, too!